We’re often told that you should never eat anything (or put anything on your body) if you don’t recognize everything on the ingredients list. But since most of us have no idea what xanthan gum or potassium benzoate are — or more importantly, what they’re doing to our bodies — we’re decoding the ingredients in the many things Americans put in (and on) themselves with the help of an expert. 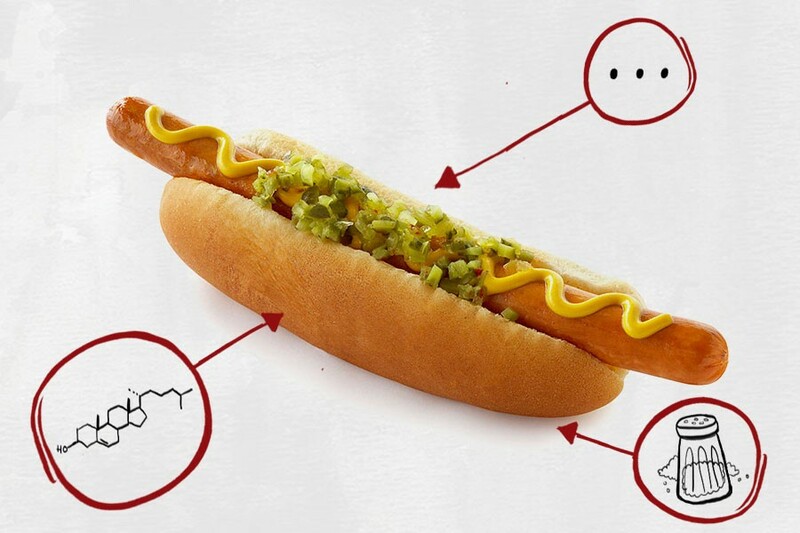 This edition: The Dodger Dog, which is made from 39 separate ingredients that we’ve broken down in the exact order they appear on both the hot dog packaging and the bun packaging. They’re then packed in a plant-based casing or a “natural casing,” aka the intestines of an animal. Tasty, right? 2) Water: The stuff that comes from your faucet. 3) Salt: Added for flavor. 4) Corn Syrup: Not to be confused with high-fructose corn syrup (which we’ll touch on shortly), corn syrup is 100 percent glucose, a simple sugar derived from corn starch. This ingredient is likely added to soften the texture of the meat so it can be easily pumped into the casing. 5) Dextrose: Similar to glucose, dextrose is a sugar derived from starches. Fun fact: Dextrose has a high glycemic index, meaning it quickly raises blood sugar levels, so it’s used in IV solutions to treat low blood sugar and dehydration. People with diabetes might also consume dextrose tablets to raise their blood-sugar levels if they become dangerously low. 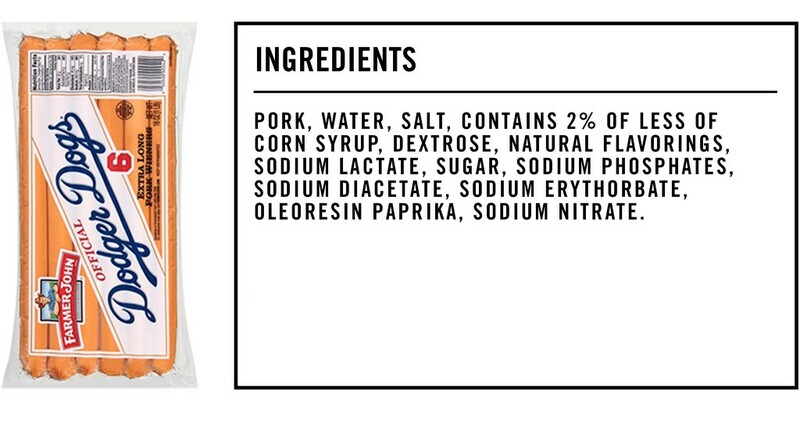 6) Natural Flavorings: Natural flavors are literally flavors derived from an actual food source — i.e., pork flavoring taken from real pigs. 7) Sodium Lactate: Sodium lactate is naturally derived from the fermentation of lactic acid (a compound produced when glucose is broken down and oxidized), and it’s usually added to meat and poultry products because the salt acts as a preservative, preventing bacteria and fungi from growing. Medicinally, sodium lactate also can be intravenously injected to remove drugs from the body after an overdose. 8) Sugar: Added for sweetness. 9) Sodium Phosphates: Sodium phosphate is a generic term that may refer to any sodium salt combined with phosphoric acid. They’re usually added as texturizers and emulsifiers, which allows for the uniform dispersion of numerous ingredients. One study suggests phosphate additives contribute to the prevalence of chronic kidney disease, and the FDA even issued a safety warning concerning the use of over-the-counter sodium phosphate products to treat constipation. All in all, this is an ingredient to be wary of. 10) Sodium Diacetate: Sodium diacetate is an acidic sodium salt widely used as a preservative to control the growth of mold and bacteria in food. It’s also commonly added to meat and poultry as a pH regulator. 11) Sodium Erythorbate: This ingredient is a synthetic variation of ascorbic acid, which is just a fancy name for vitamin C. It’s used to prevent microbial growth and to preserve freshness. While sodium erythorbate is generally considered to be safe, you may experience headaches, dizziness, fatigue and lethargy if you’re sensitive to it. 12) Oleoresin Paprika: Oleoresin paprika is an oil-soluble extract from the capsicum annuum or capsicum frutescens fruits. It’s primarily used as a coloring agent or to add extra spice. 13) Sodium Nitrate: Sodium nitrate is yet another salt-based preservative that’s widely used in hot dogs, bacon and other cured meats. In higher doses, nitrates are also used as fumigants to kill rodents—and can leach into the soil, contaminating food supplies. It’s no surprise that this ingredient is problematic: A study by the Cancer Research Center of Hawaii and the University of Southern California suggests a link between consuming processed meats (which are manufactured with sodium nitrate) and cancer risk. The study followed 190,000 people, ages 45–75, for seven years and found that people who ate the most processed meats had a 67 percent higher risk of pancreatic cancer than those who ate the least. Other studies found that a high concentrate of sodium nitrate in infants and toddlers can lead to a condition called “blue baby syndrome,” which can sometimes be fatal. This happens when nitrates bind to red blood cells, blocking their ability to carry oxygen throughout the body. *Hostess makes a 10” bun specifically for the Dodger Dog. 1) Enriched Wheat Flour (Wheat Flour, Niacin, Ferrous Sulfate, Thiamin Mononitrate, Riboflavin, Folic Acid): As we learned in our exploration of the many ingredients in the McDonald’s Big Mac, enriched wheat flour is a troubling ingredient for a couple of reasons. In addition to containing more calories than unbleached whole wheat flour, the bleaching process presents an unfortunate byproduct: A chemical called alloxan, which is used to induce diabetes in lab-animal test subjects by destroying their pancreas. In other words, if you have a family history of diabetes or disorders of the pancreas, it’s probably best to ditch the bun. 2) Malted Barley Flour: Malted barley flour is made from barley that’s allowed to germinate. It’s then steam-dried, hulled, ground and sifted. 3) Water: Just more H2O. 4) High-Fructose Corn Syrup: High-fructose corn syrup is corn syrup that has had some of its glucose converted to fructose enzymatically. It’s a commonly used sweetener, and has been linked to obesity and diabetes by many, many studies. There’s no consensus on whether it’s worse than regular sugar, but either way you might want to avoid it. 6) Soybean Oil: According to physician and biochemist Cate Shanahan, author of Deep Nutrition: Why Your Genes Need Traditional Food, soybean oil is the most abundant of vegetable oils. Consuming too much of it — which is easy to do, considering Shanahan says roughly 45 percent of the average American’s calories come from refined oils — has serious repercussions (e.g., fatty liver disease, insulin resistance and migraines), as we learned in our exploration of all 26 ingredients in nacho-flavored Doritos. 8) Wheat Gluten: Those with celiac disease beware: Wheat gluten is wheat flour that’s been hydrated to activate the gluten, then processed to remove everything but the gluten. It’s added to improve the chewiness of the bun. 9) Sugar: Added for sweetness. 10) Wheat Flour: Wheat flour is a powder made from grinding wheat. Duh. 11) Calcium Sulfate: Calcium sulfate is added to stabilize foods and regulate their acidity levels. It can also be used as a flour treatment agent to increase the speed of dough rising and to improve the strength and workability of the dough. In the amounts typically found in food, calcium sulfate isn’t likely to cause adverse effects and is generally regarded as safe by the FDA. 12) Enzymes: Enzymes are commonly added to bread products to break down complex starches into simple sugars. 13) Hydrogenated Soybean Oil: Soybean oil might be bad, but hydrogenated soybean oil is worse: When you add hydrogen to food via hydrogenation — which many manufactures do to increase the food’s shelf life — you get trans fats. Unfortunately, trans fats raise cholesterol, harden arteries and inhibit the formation of an enzyme called cyclooxygenase, which helps determine the dilation of your arteries and regulates blood flow. So watch out for this ingredient. 14) Mono and Diglycerides: Mono (aka, monoglycerides) and diglycerides are dough conditioners added to improve the texture or quality of dough. They’re often packed with trans fats that aren’t listed on the nutrition facts label, which isn’t great because trans fats are associated with an increased risk of heart disease, stroke and diabetes. And so, consuming more than you think you are (because they weren’t listed on the label) could do serious damage to your body. 15) Sorbic Acid: Another preservative used for its antimicrobial properties, sorbic acid is on the FDA’s list of “generally recognized as safe,” or GRAS, substances. 16) Calcium Propionate: Yet another contributor to the Dodger Dog’s seemingly interminable shelf life, calcium propionate is an antifungal added to many bread products to prevent mold growth. In addition to being linked to migraines, a 2002 study in the Journal of Paediatric Child Health found that chronic exposure to calcium propionate in children caused irritability, restlessness, inattention and sleep disturbance. So for the sake of your kid’s health and your sleep schedule, maybe split a single Dodger Dog next time you’re at the ballpark. 17) Vinegar: Vinegar is typically added for flavor. 18) Ascorbic Acid: As we mentioned earlier, ascorbic acid is just another name for vitamin C. Here, it’s used as a preservative. 19) Monoglycerides: See “Mono and Diglycerides” above. 20) Citric Acid: Citric acid naturally occurs in citrus fruits, and it’s often added to foods to extend their shelf life. 21) Soy Lecithin: Soy lecithin is a component of fat found in (you guessed it!) soy. It’s typically added to food products as an emulsifier: In simpler terms, it helps the numerous ingredients found in these buns mix together. “It’s also frequently used to extend product shelf life,” explains Dagan Xavier, ingredient expert and co-founder of Label Insight. Board-certified nutrition specialist Jason Boehm adds that unless you have an extreme allergy to soy — which you’d know by now — soy lecithin isn’t anything to worry about. 22) Sodium Stearoyl Lactylate: This ingredient is commonly incorporated in baked goods to strengthen dough, mix liquids and oils together and replace some fat and sugar. While it’s considered to be safe by the FDA, some people may experience an allergic reaction to the ingredient that consists of itching, swelling, mucus production, muscle spasms, hives and rash formation. 23) DATEM: DATEM (diacetyl tartaric acid esters of monoglycerides) is another potentially harmful dough conditioner, since it’s been found to cause heart problems in lab animals. Whether or not it should be a real point of concern for consumers, however, is still up for debate. 24) Ammonium Sulfate: In baking, ammonium sulfate is used as a dough conditioner and dough strengthener. While manufacturers claim it’s safe in small amounts, this ingredient can also be found in fertilizers, and studies show that exposure to high levels of ammonium sulfate can result in respiratory failure, so beware of foods containing this ingredient. 25) Monocalcium Phosphate: In baked goods, monocalcium phosphate reacts with baking soda to produces carbon dioxide, which helps the dough rise. When consumed in moderation, this ingredient isn’t anything to worry about. That said, an excessive amount of phosphates in the diet, particularly when contained in processed foods like Dodger Dogs, can accelerate the aging process, increase the risk of heart disease and place undue stress on the kidneys. 26) Calcium Peroxide: When used during baking, calcium peroxide strengthens the gluten wall in dough for better texture and moisture retention. Along with numerous other dough conditioners, calcium peroxide has been banned by Whole Foods, since as DATEM and ammonium sulfate have shown, dough conditioners tend to be dangerous for consumption. Dodger Dogs are the food equivalent of atomic bombs. The really bad news is that they aren’t all that different from regular hot dogs you might cook up at home — they’re just a few inches longer. So next time you consider grilling a dozen hot dogs for the family when you find yourself in a pinch, just remember: If anything is going to increase your (and their) chances of developing diabetes, becoming obese, experiencing heart failure or requiring a kidney donation, it’s a colon full of encased meats.